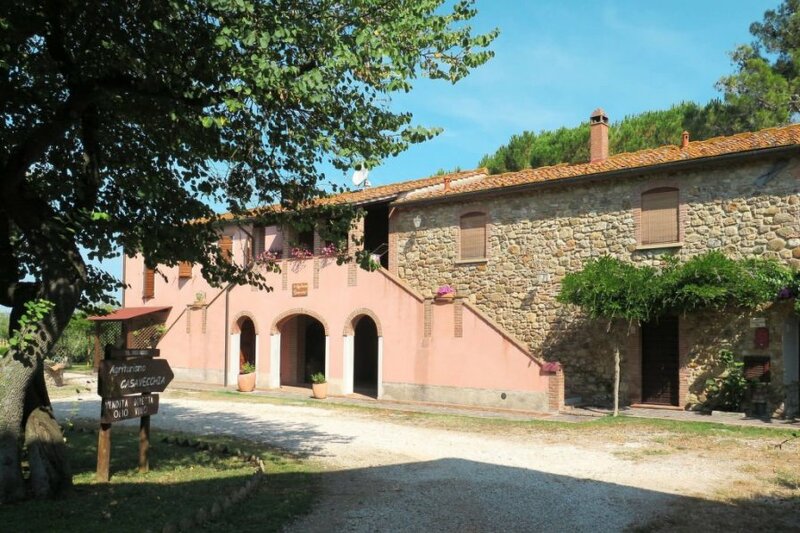 This 1 bedroom villa with swimming pool is located in Suvereto and sleeps 4 people. It has WiFi, air conditioning and barbeque facilities. Apartment, 2 - 4 people, 2 room/s, 1 bedroom/s, 1 bathroom/s, approximately 37 m², 1 floor/s, apartment on ground floor, separate access to the property. Furnishing: rustic, pleasing, tiled floor. Equipment: internet access Wi-Fi in the outdoor area (included); combined heating/air conditioning; air conditioning (not available in the bedrooms). Electricity according to consumption approximately € 0.40/​kWh. Heating/air-conditioning if required, € 5/​day. Holiday resort tax. Linen/towels available. Change of bed linen/​towels every 7 days included. Deposit € 150 (in cash). Cot € 25 per stay (on order). Pet not allowed. Situation: in the district Calzalunga. Estate (shared use with holiday guests): trees, meadow. Outdoor facilities(shared use): terrace (roofed), reserved open space, furnishing provided (garden tables, chairs), barbecue, pizza oven. Pool (shared use): 12.0 x 6.0 m, 25/05/19-28/09/19. Pool area: deck chairs, sun loungers, external shower. Important information: Internet access (WiFi included) only in the outdoor area. The agent describes this villa as a family friendly holiday rental ideal for the summer holidays. It is also good value for money. This villa is located in Suvereto. It is set in a convenient location, just 0 metres away from a beach and 4.5km away from the city center. The villa has free wireless internet. The villa is adequately equipped: it has air conditioning. It also has a BBQ. The villa is suitable for family friendly summer holidays as well as relaxing winter holidays.